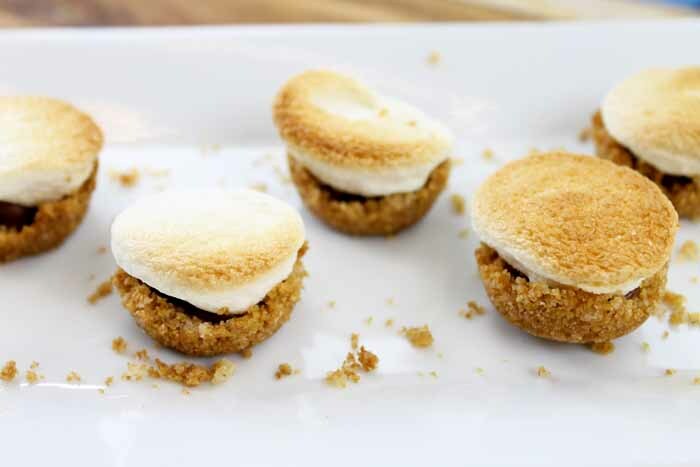 Make indoor smores with our fun bite sized snack recipe. You and the kids will love this simple snack recipe that can be made in just minutes. 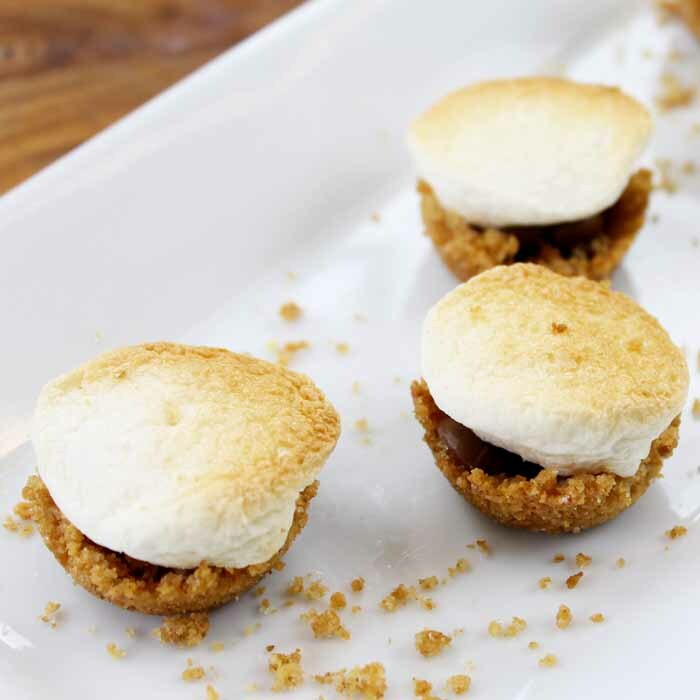 Graham cracker crust, milk chocolate, and a delicious toasted marshmallow to top things off. It doesn’t get much better than that! Start by crushing your graham crackers and melting your butter. Then add the crumbs, sugar, and butter to a bowl. Mix well. Grease a mini muffin tin. Then add in about a tablespoon of your mixture to the bottom of each cup. Press slightly to form up the sides like a cup. Bake at 350 degrees F for 3 – 4 minutes. While backing, cut 12 marshmallows in half with a knife. Immediately upon removing from oven, add in 4 – 5 chocolate chips in the bottom of each cup and top with a marshmallow half (cut side down). Return to oven and bake at 350 for 2-3 minutes. Then broil for 1-2 minutes. Keep a watch on them when broiling and remove when the marshmallows are the color that you like them. IMPORTANT: Allow to cool in the pan about 5 – 7 minutes before removing. Otherwise the graham cracker crusts will not stay together. Love this and want to see it in action? Watch the super short video below to see me make a batch of indoor smores for my family! Now doesn’t that make you want to gobble up a plate of these delicious bite sized snacks. Make some of these when the kids get home from school or for a family movie night. 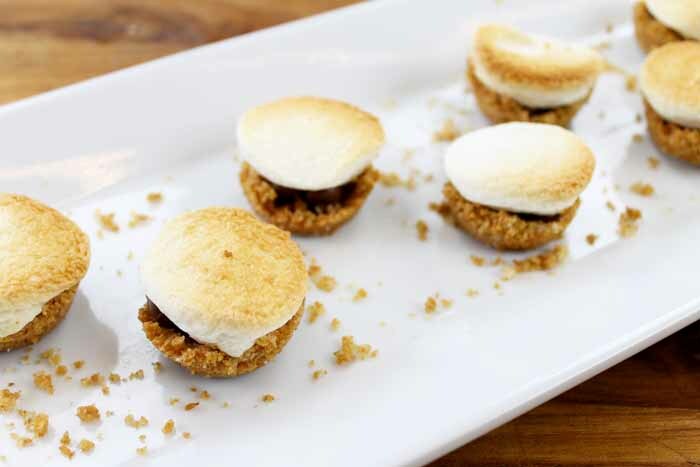 Everyone will love these indoor smores and you will love just how easy they are to make! Keep the ingredients on hand so that you can make these any day of the week. 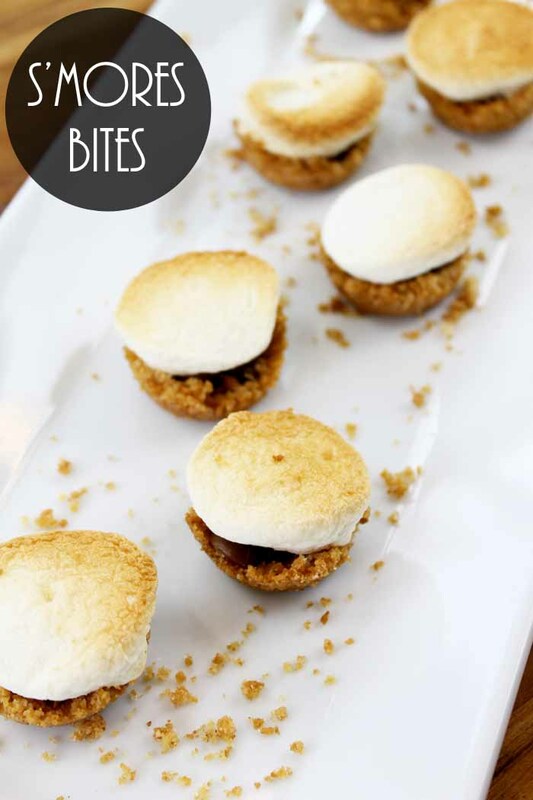 Love these indoor smores and want more recipes? Click the links below! Start by crushing your graham crackers and melting your butter. Then add the crumbs, sugar, and butter to a bowl.Mix well. Grease a mini muffin tin. Then add in about a tablespoon of your mixture to the bottom of each cup. Press slightly to form up the sides like a cup. Bake at 350 degrees F for 3 - 4 minutes. While baking, cut 12 marshmallows in half with a knife. Immediately upon removing from oven, add in 4 - 5 chocolate chips in the bottom of each cup and top with a marshmallow half (cut side down). Return to oven and bake at 350 for 2-3 minutes. Then broil for 1-2 minutes. Keep a watch on them when broiling and remove when the marshmallows are the color that you like them. Allow to cool in the pan about 5 - 7 minutes before removing. Otherwise the graham cracker crusts will not stay together. These are so cute! They look perfect for people like me, who don’t have access to a fire-pit or even a gas stove. I’m looking forward to trying these! We often enjoy making s’mores over a campfire but this would be perfect for a rainy day! Yum! These little smores look great! What a cute idea!